During the end of last year, I was invited by the Beijing People’s Association for Friendship With Foreign Countries (BPAFFC) to visit Beijing and Shanghai. I had the pleasure of visiting them for three days in December along with 25 other members from my party and other political parties who are passionate about improving the friendship between China and Japan. I was given the honor to be the leader of this group for the duration of the trip. Tokyo and Beijing has been deepening their relations as a friendship city since 1979. Since 2017 marked the 45th anniversary of the declaration of friendship between China and Japan, both countries celebrated and promised to further develop this friendship. In Beijing I paid a visit to the Standing Committee of Beijing Municipal People’s Congress and talked with the representative. We discussed and agreed on the importance of interactions between individual congress members and the cooperation of both cities. 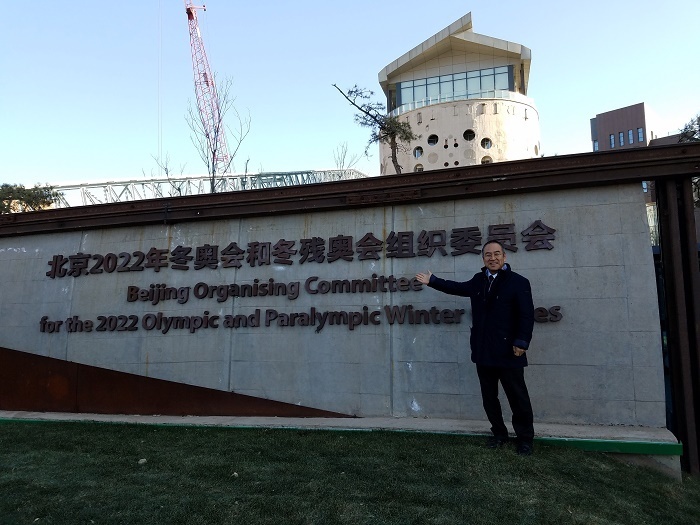 I also visited the Beijing Winter Olympics Committee and discussed both of our preparations towards the Olympics. In Shanghai we paid a visit to the Shanghai Ministry of Foreign Affairs and also received their insight into the preparation of the Olympics. On this occasion, we were told that they hope that we can deepen our relations on not only the congress level but on the civilian level as well, using the Tokyo Olympics as a chance to do so. My stay in China was a short one, but I was able to witness the phenomenal growth of the country and gain a better understanding of their visions and intentions for the future. Nous avons visité Beijing et Shanghai du 17 au 20 décembre 2017 par l’invitation de l’Association d’amitié populaire avec l’Etranger de la ville de Beijing. La délégation comprend des membres de l’Assemblee métropolitaine de Tokyo et des représentants des Conseils d’arrondisssement de Tokyo. Ils sont des hommes poliques désireux de développer de bonnes relations entre le Japon et la Chine surtout au niveau de collectivité locale. Je me suis chargé du chef de délégation, une tâche bien lourde de responsabilité. Tokyo et Beijing nouent la relation de ville d’amitié depuis 1979. 2017 est l’année du 45e anniversaire de la normalisation des relations diplomatiques entre le Japon et la Chine. Nous avons profité de cette occasion pour envoyer une délégation des élus locaux de Tokyo en Chine en espérant promouvoir des échanges entre les deux villes et contribuer au développement des relations d’amitié entre les deux pays. A Beijing, nous avons fait une visite de courtoisie au Congrès du peuple de la ville de Beijing. Nous avons convenu de la coopération entre les deux capitales et du développement des échanges entre les membres de l’Assemblée déliberante de deux villes. Nous avons ensuite visité le Comité olympique d’hiver de Beijing. Nous y avons écouté avec intérêt, en tant que les intéressés des Jeux olympiques de Tokyo en 2020, une explication instructive sur l’état actuel de préparation pour les Jeux olympiques d’hiver de Beijing en 2022. A Shanghai, nous avons visité la Division des affaires extérieures du gouvernement populaire de la ville et nous nous sommes renseignés sur le programme du développement économique de la ville. Nos interlocuteurs se sont exprimés un espoir de voir s’approfondir des échanges au niveau citoyen aussi. *Clarté des objectifs du développement national (diriger le monde avec la technologie environnementale) étc. On December 7th, the Acting Ambassador of the Republic of Togo, Mr. Afognon Kouakou Sedaminou as well as Public Relations Sector Manager Jules Kankoe Aduayom joined us at the Tomin First Reception. This meeting with them was a continuation from our previous talk (from Cosmopolitan Address 1), where we discussed the environmental issues of Togo. This time, we talked more specifically about which Japanese technologies we could employ to help ameliorate the problem. Since taking care of the entire recycling system is not efficient, we decided to focus on the collection and management of plastic waste, using Japanese assistance. We agreed that we should ship necessary equipments right away to Togo. I personally wish for this project to go as smoothly and as fast as possible. Upon conversing about this matter of waste, I also told them about the “waste wars” epidemic that happened in Tokyo in the sixties, where districts pitted against each other over the problem of waste management and ultimately was coaxed by the government to all accept waste processing. Both Mr.Sedaminou and Mr. Aduayom were highly interested in this epidemic, and listened to my story intently. Le 7 décembre 2017, j’ai reçu la visite de monsieur Aforgnon Kouakou SEDAMINOU, chargé d’affaires à l’ambassade du Togo, accompagné de monsieur Jules Kankoe ADUAYOM. chef de Service des relations publiques, au siège du Tomin First No Kaï de l’Assemblée métropolitaine de Tokyo. Cette visite fait suite d’un entretien que j’ai eu le 4 octobre 2017 (« Les Nouvelles » 1) avec mes amis togolais à propos d’une situation inquiétante de l’environnement à Lomé. La visite du 7 décembre a pour but d’échanger des vues sur les mesures à prendre pour concrétiser l’assistance technique du Japon dans le domaine de l’élimination des ordures ménagères à Lomé. Etant évidemment trop ambitieux de parler de tous les aspects des ordures ménagères, nous avons décidé de discuter d’abord sur l’aide japonaise possible pour améliorer la méthode de collecte et de l’élimination des déchets plastiques tels que les bouteilles en plastique. Nous avons convenu qu’il est souhaitable d’importer du Japon des machines nécessaires pour cela. J’ai promis donc de leur apporter un soutien pour la concrétisation de ce projet à bref delai. J’ai expliqué à cette occasion « une guerre des ordures ménagères » à Tokyo dans les années 1960. Elle a confronté les deux arrondissements de Tokyo: l’un expédie des ordures et l’autre en reçoit pour l’élimination. Le gouvernement local de Tokyo a beaucoup de mal à trouver une solution acceptable à tous les citoyens. Les interlocuteurs togolais m’écoutaient avec intérêt. 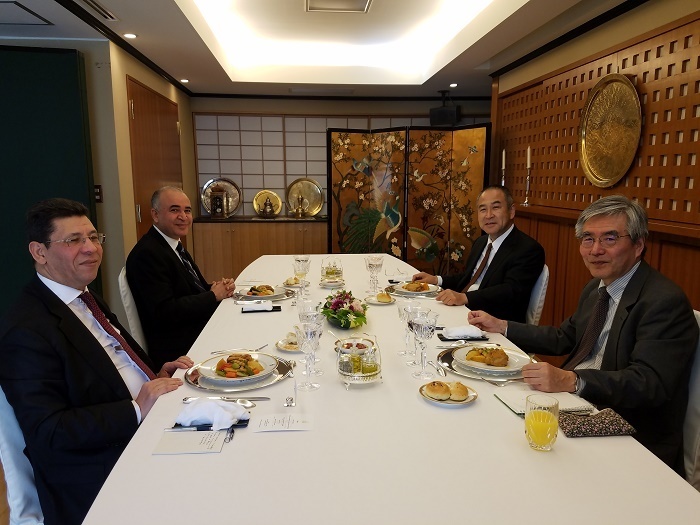 On December 7th, at the Tunisian Embassy close to the Yasukuni Shrine, I had the pleasure of meeting Ambassador Kais Darragi and Minister Naceur Ouni. As we shared lunch, we conversed about the recent state of Tunisia. 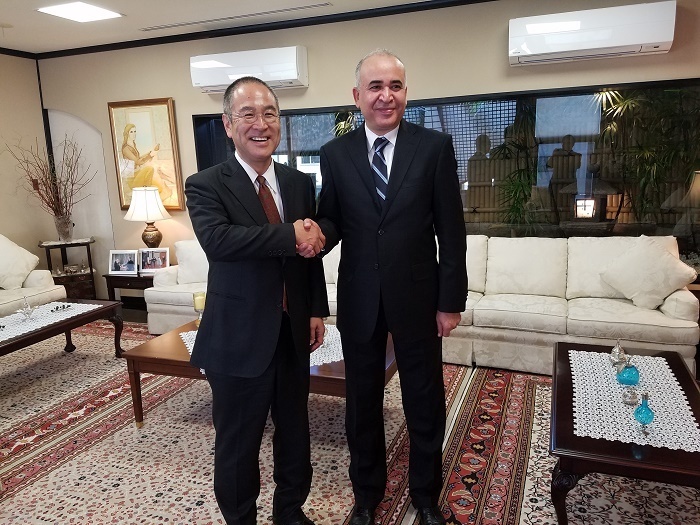 Ambassador Darragi had been appointed his post in Japan two years ago, but had lived in Japan for four years prior to that, making his overall residency a total of six years. Mr.Darragi had great insight of not only Japanese politics and economy, but also of Japanese history and culture as well. He mentioned that he is excited for the 2018 soccer World Cup, and is hopeful to see a match between Tunisia and Japan, whom may compete if both countries pass the first round. One of the many curiosities of Arab culture to the Japanese, may be the position that Arabian women are placed in the social hierarchy and the problems that they may face. How equal are women and men treated in Tunisia? Mr.Darragi explained two notable points regarding the matter. The first is, in comparison to other Arabian states, in Tunisia the social position of women were traditionally higher than that of men. Polygamous marital relations were a rarity, and was made illegal in 1960 by president Bourguiba—which solidified the lawful perspective on the matter for the first time. The second point is, ever since that period, the equality of women has been rapidly progressing. For example, before then it was commonplace for higher status men to get married with lower class women. However recently, it has become just as common for higher class women to marry lower class men. Mr. Darragi explains that this shift is probably caused by the increase of women in the educational field. 1960 in Tunisia was also when the literacy rate began improving immensely. With 1.14 Million citizens, there were 178 facilities for higher education—13 of them being National Universities, and 24 technological universities. There would be more if we count the Private Universities. Through this increase in educational facilities, more and more girls and women began attaining higher education. Today, there are more female students in colleges than male students. Thus, we can be hopeful that more women will be standing in leadership positions in the future. We can say that these factors make Tunisia different from other Arabian states, such as Saudi Arabia— where women only just attained the rights to have a drivers license. In fact, the first female pilot of Africa was a Tunisian woman! The Arab Spring of 2011 ended the dictatorship of President Ben Ali, but it also brought forth great political calamity. However, the negative effects of the incident was not as catastrophic in Tunisia compared to other Arab states. Ambassador Darragi speculates that this is due to the higher level of education that the general Tunisian population had, and thus they were more adept at handling the political turmoil. However, the attainment of higher education is not all positive. Many graduates nowadays can not find a job after graduation, and unemployment rates are at 15%. Ambassador Darragi worries that this economic situation may raise fear for the future in civilians. On October 20th, I had the pleasure of meeting and talking with the temporary Acting Ambassador of the Republic of Togo, Mr.Sedaminou Alogno Kouakou. In our hour and a half of talking, Mr.Sedaminou expressed gratitude for the ambulance and fire truck that has been donated by Japan, and stated that they valued our help immensely and plan to support and contribute to the development of both our economy, and relationship. When I inquired about the socioeconomic improvement plans of the Togolese government, Mr.Sedaminou informed us that there are a few projects in progress right now, but the field that they are putting in the most effort is the environmental sector. Mr.Sedaminou mentioned that the recycling/trash management system needs immediate improvement, and that it would be ideal to have Japanese technological assistance. 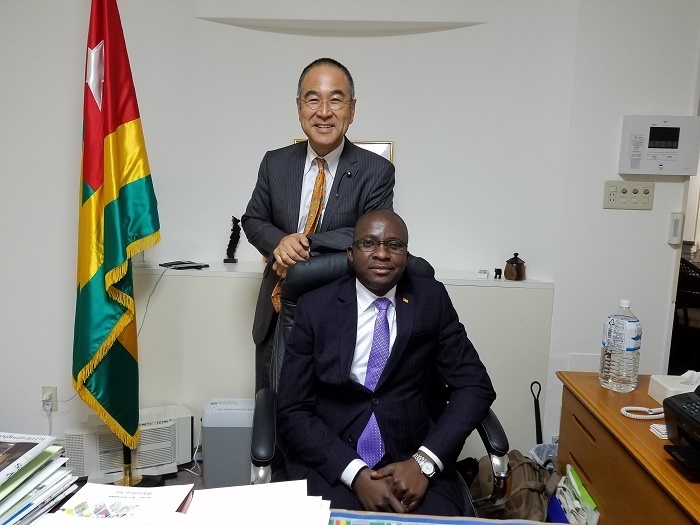 Le 20 cotobre 2017, j’ai rendu visite à monsieur Alogno Kouakou SEDAMINOU, charge d’ affaires de l’Ambassade du Togo au Japon. J’ai eu un entretien très amical et fructueux de la durée de plus d’une heure. L’ambassadeur a dit que son gouvernement apprécie beaucoup une aide japonaise au développement économique et sociale du pays. Le Japon avait déjà fait don d’une ambulance et une voiture de pompiers par l’intermédiaire de l’Association des sapeurs-pompiers de Tokyo. Il souhaite également que progresse à l’avenir la contribution japonaise au développement économique du Togo. A ma demande des explications sur les plans gouvernementaux de développement économique et social, monsieur SEDAMINOU a précisé que quelques projets d’amélioration de l’environnement urbain étaient en cours. La construction d’un système de traitement des ordures ménagères y compris une méthode efficace de collecte est un problème à resoudre de toute urgence. L’ambassadeur a suggéré que la contribution technique japonaise dans ce domaine soit fortement demandée. The Tokyo Olympic and Paralympic is inching nearer every day, leaving us only two and a half more years. We look forward to welcoming all our international guests and would like to work together to make the Olympic a success. As a member of the Tokyo Metropolitan Assembly, I have always recognized the importance of global, cosmopolitan interactions and have served to better such intercommunications. While doing this, I have come to realize that to truly make differences in relations, one must be wholeheartedly interested in the other country or city’s situation, and must actively deepen their knowledge of them. Thus, as one way of initiating this and providing information, I have set up this Cosmopolitan Intercommunication Address. In other efforts, I have also been visiting and conversing with various Ambassadors and their staff members in Tokyo, and through these interactions, have been attempting to develop micro level connections to deepen and strengthen our state relations. In conclusion, it is my wish to dispatch information concerning life in Tokyo to the world outside—and it would be my greatest pleasure to have your support and cooperation, to bring all our relations to the next level. Thank you. Les Jeux olympiques et paralympique de Tokyo en 2020 auront lieu dans deux ans et demi. J’aimerais que chacun de mes concitoyens soit prêt à accueillir chaleureusement des visiteurs étrangers et à contribuer au succès des Jeux olympiques. En tant que l’un des membres de l’Assemblée métropolitaine de Tokyo, je participe activement depuis longtemps au développement des échanges internationaux en reconnaisssant son importance pour une ville internationale comme Tokyo. Ce que j’ai réalisé par mon expérience de longue date, c’est que pour développer concrètement les échanges interurbains, il faut que chaque citoyen s’intéresse aux situations des autres pays et de leurs habitants. J’ai décidé donc de lancer un blog « Les nouvelles des échanges interurbains » de Shigeru ISHIGE pour fournir des informations variées à mes concitoyens. Je commencerai dans un premier temps, à visiter les ambassades de différents pays à Tokyo pour échanger des vues avec des ambassadeurs et des diplomates à propos du développement des échanges internationaux de Tokyo comme ville internationale. Désormais, j’essaierai aussi d’envoyer des informations sur Tokyo et la vie des habitants à l’étranger. Je voudrais demander votre soutien et coopération.